• The dodecahedron, the icosahedron and E8, Annual General Meeting of the Hong Kong Mathematical Society, Hong Kong University of Science and Technology. It’ll take place on 10:50 am Saturday May 20th in Lecture Theatre G. You can see the program for the whole meeting here. The slides are in the form of webpages, and you can see references and some other information tucked away at the bottom of each page. which is one-to-one except at the origin. 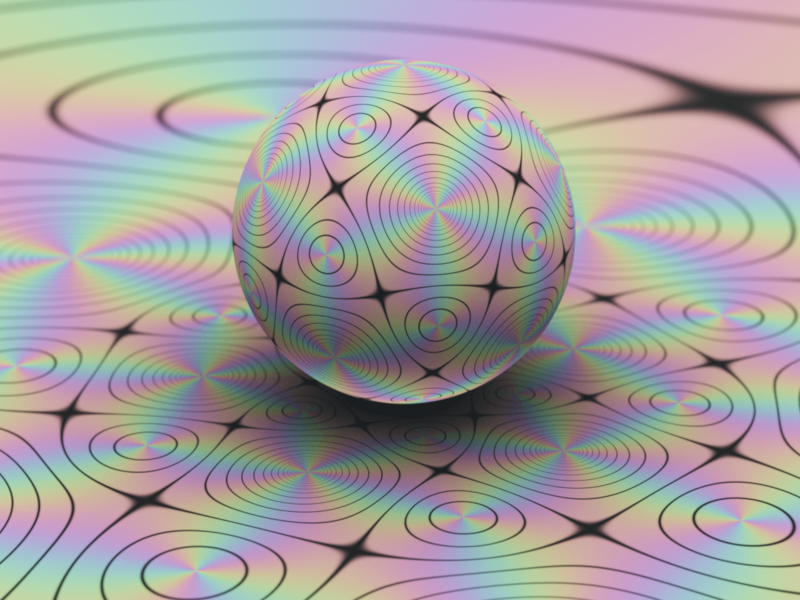 The points that map to the origin lie on a bunch of Riemann spheres. There’s one of these spheres for each dot in some Dynkin diagram—and two of these spheres intersect iff their two dots are connected by an edge! But the puzzle is this: why does resolving the singular variety gives a smooth variety with a bunch of copies of the Riemann sphere sitting over the singular point at the origin, with these copies intersecting in a pattern given by a Dynkin diagram? • Klaus Lamotke, Regular Solids and Isolated Singularities, Vieweg & Sohn, Braunschweig, 1986. I would like to understand this better, and more vividly. I want a really clear understanding of the minimal resolution For this I should keep rereading Lamotke’s book, and doing more calculations. I do, however, have a nice vivid picture of the singular space For that, read my talk! I’m hoping this will lead, someday, to an equally appealing picture of its minimal resolution. This entry was posted on Tuesday, May 16th, 2017 at 9:39 am and is filed under mathematics. You can follow any responses to this entry through the RSS 2.0 feed. You can leave a response, or trackback from your own site. To see the next slide, just click the button at top left saying “Next”. I just ran into the mathematician Roger Howe, who is visiting the Insititute of Advanced Studies here at HKUST. He was a professor at Yale back when I was a postdoc there… and still is. He argued that there are insufficiently exploited connections between the Platonic solids and the number 12. Puzzle 1. What does the regular tetrahedron have 12 of? Puzzle 2. What does the cube have 12 of? Puzzle 3. What does the dodecahedron have 12 of? Puzzle 4. How can you set up a bijection between the 12 things of the tetrahedron and the 12 things of the cube? Puzzle 5. How can you set up a bijection between the 12 things of the cube and the 12 things of the dodecahedron? These seem like the easy ones. Puzzle 2. A cube has 12 edges. Puzzle 3. A dodecahedron has 12 faces. These seem a little harder. Puzzle 1. A regular tetrahedron has 12 face medians (the medians of each triangular face). Puzzle 4. A regular tetrahedron can be inscribed in a cube so that each edge of the tetrahedron is a diagonal of a face of the cube. The tetrahedron and cube will be concentric. We can radially project the tetrahedron to the cube from their common center. The 4 face centers of the tetrahedron get mapped to the 4 vertices of the cube which are not also vertices of the tetrahedron. The segment of the tetrahedron’s face medians which connects the face center to a vertex will be mapped to an edge of the cube. Puzzle 1′: What are these other 12 things that the tetrahedron has? Puzzle 4′: How can you set up a bijection between these other 12 things and the 12 edges of the cube? Puzzle 6: How are these other 12 things related to the 12 medians of the tetrahedron’s faces? I suppose I should warn everyone that these other 12 things are considerably more abstract, and not just another way of talking about its 12 face medians. Is it rotations that map the tetrahedron onto itself? Chose two medians (not necessarily distinct) and there is a unique rotation that maps one to the other. Fixing one of the two gives a bijection between the rotations and the other median. Is it also of interest that there is more than one way of constructing each bijection? I think I’ll give away Roger Howe’s preferred answers to puzzles 1 and 4. Puzzle 1. A tetrahedron has 12 rotational symmetries: we can rotate our favorite vertex to any of the 4 vertices in 3 different ways. Puzzle 4. If we inscribe a tetrahedron in either of the ways shown below (thanks again to Greg Egan), and pick a ‘favorite’ edge of the cube, each of the 12 rotational symmetries of the tetrahedron will carry our favorite edge to one of the 12 edges. This gives a bijection between rotational symmetries of the tetrahedron and edges of the cube. This is not perfectly natural since it involves a choice – a choice of a cube edge. We can eliminate this unnaturalness if we follow Allen Knutson’s suggestion: instead of using rotational symmetries of the tetrahedron, use vertex-edge flags. A vertex-edge flag for the tetrahedron is a vertex together with an edge it lies on. There is a natural bijection between edges of the cube and vertex-edge flags of the tetrahedron. Here I’m using ‘natural’ to mean preserved by the rotational symmetries of the tetrahedron. For experts: vertex-edge flags form a torsor for the group of rotational symmetries of the tetrahedron: i.e., a set on which this group acts freely and transitively. Identifying a torsor with the group itself requires choosing an arbitrary point of the torsor, which we identify with the identity in the group. With less jargon: if we choose any vertex-edge flag as our ‘favorite’, each rotational symmetry carries it to another vertex-edge flag, and this sets up a bijection between rotational symmetries and vertex-edge flags. If we inscribe the tetrahedron in a cube, the edges of that cube form a torsor for the group of rotational symmetries of the tetrahedron. If we then inscribe the cube in a dodecahedron, so do the faces of the dodecahedron! Puzzle 1: There are 12 unique directions along the edges. Each can be traversed only once in making a complete circuit. In fact, there are several kinds of things that the tetrahedron has 12 of (even staying no more abstract than “face median”). For two answers to Puzzle 1 that I have in mind, Puzzle 4 is easy for one of them, but I don’t know whether it’s solvable for the other one. 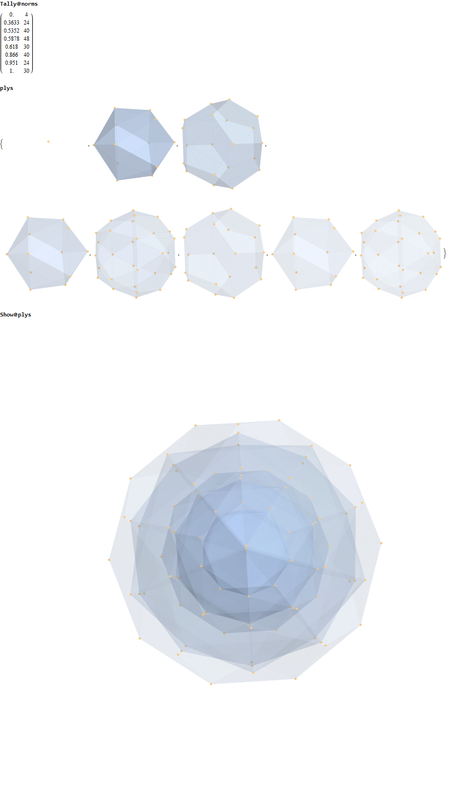 Over on G+, Allen Knutson suggested something besides ‘face medians’ that a tetrahedron has 12 of: ‘vertex-edge flags’. A vertex-edge flag is a vertex together with a face it lies on. Puzzle 6. How many isomorphism classes of 12-element A4-sets are there? In simple rough terms: how many ‘fundamentally different ways’ are there to find 12 things in a tetrahedron? For example, the set of face medians is a 12-element A4-set, and so is the set of ‘vertex-face flags’ (defined in the obvious way). But these are isomorphic as A4-sets, since a face median touches one vertex and one face, and these give a vertex-face flag. except that it seems to come down to counting unordered sums instead of ordered sums. Two actions of a finite group on a finite set are isomorphic if and only if they have the same number of orbits of the same length. The length of an orbit is the index of a point stabilizer in the full group. 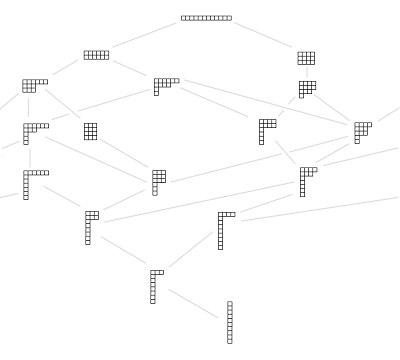 There appear to be 17 equivalence classes of actions of on a 12 element set. In a solid tetrahedron there are no points with orbits of length 3 under the action of . So it appears that for any 12 point subset of a solid tetrahedron there are only 7 equivalence classes of actions by . But if acts on collections of subsets of the tetrahedron then we can get an orbit of length 3. For instance there are 3 pairs of opposite edges. Other orbits of length 3 could be obtained this way by selecting other points from the tetrahedron’s medians. So it seems that all possible equivalence classes of actions of on a 12 element set would be possible with a regular tetrahedron. Impressive analysis! This is one of the few interesting appearances of the number 17 in mathematics… and it’s seemingly unrelated to the others. and 17 is prime. The other is that there are 17 wallpaper groups. Plutarch wrote that the Pythagoreans “utterly abominate” the number 17. It’s probably questionable to say these are the only interesting appearances of 17. See also http://mathworld.wolfram.com/LuckyNumberofEuler.html Lucky primes are related to Heegner numbers . For the regular polyhedra someone on G+, probably Layra Idarani, pointed out that these numbers are called “the order of the rotational symmetry group of the polyhedron”. There’s a nice generalization to the polytopes associated to Coxeter groups. For other, non-regular polyhedra these numbers seem a bit more mysterious to me. It must be more general than the order of the rotation group if it applies to all polyhedra. Perhaps it is the vertex-edge-face flags that count. There would be twice as many of those. This would generalise to higher dimensions. Is that something from cohomology? Certainly the vertex-edge-face flags are more fundamental—or in general, for any polytope, the ‘complete’ flags. I don’t know the meaning of the number of these flags. But there’s an excellent group that acts on the complete flags regardless of whether the polytope is regular or not! It’s called the cartographic group. It has one generator for each dimension. In the case at hand, when we’re starting with a polyhedron, these generators could be called and Their meaning is ‘change the vertex’, ‘change the edge’ and ‘change the face’. You see, if you have a vertex-edge-face flag, there’s exactly one way to change the vertex and get a new such flag. Similarly there’s one way to change the edge, and one way to change the face. This presentation defines the cartographic group. This story extends to vertex-edge flags, or edge-face flags, or vertex-face flags. Various quotient groups of the cartographic group act on these. All this generalizes to arbitrary dimensions. In general, each generator of the cartographic group. squares to 1, and generators that aren’t of neighboring dimensions commute. Today at breakfast Roger Howe suggested trying to construct the Leech lattice (a 24-dimensional lattice) or Golay code (a linear code consisting of 24-bit strings) starting the tetrahedron, roughly as follows. There are lots of significant problems left to solve, but it’s a cute idea. • Wikipedia, Binary tetrahedral group. If you set up things nicely, these 3 cross-polytopes inside the 24-cell get permuted when we permute the quaternions i, j, and k. This is called ‘triality’. perhaps they can be used to help understand how we build the Leech lattice out of 3 copies of the E8 lattice, or build the Golay code out of 3 copies of the 8-bit Hamming code! • Integral octonions (part 9). The question is whether this is at all illuminated by the geometry I just described. It’s worth noting that Greg and I already did connect triality to the Turyn construction of the Leech lattice. The three E8 lattices used to build the Leech lattice can be thought of as lying in the vector, left-handed spinor, and right-handed spinor representations of . These representations are permuted by the triality automorphisms of . Furthermore, the weight lattice of is a 4-dimensional lattice generated by the points in the 24-cell, and the weights of the vector, left-handed spinor and right-handed spinor representations lie in the 3 cross-polytopes I mentioned! So, all this stuff does fit together. I guess the question is whether the Turyn construction makes a bit more sense if we examine it in this larger context. A new visualization of the split real even E8 directly projected to concentric platonic solids (icosahedra, dodecahedra / rhombic triacontahedra).